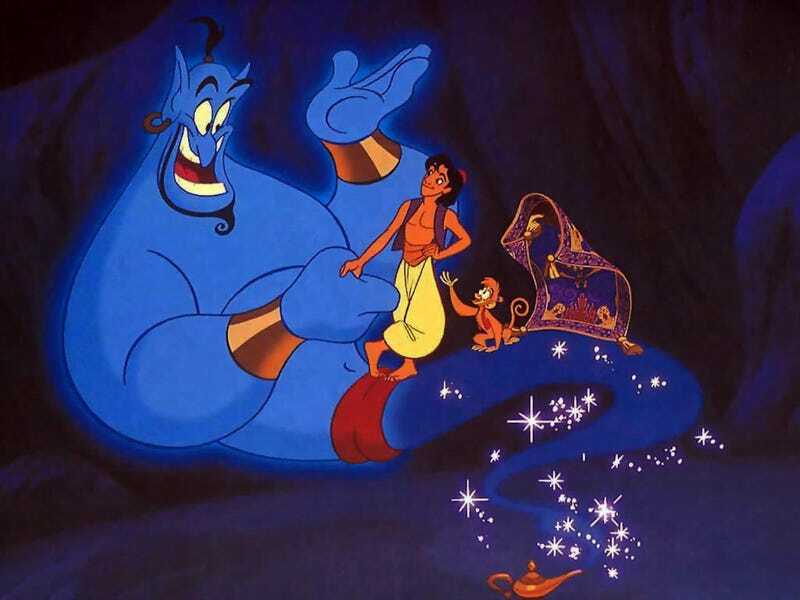 If you’ve seen even the tiniest portion of Robin Williams’ performance as the genie in Aladdin, then it won’t come as a shock to you that there a ton of his material that never made it to the final cut. And now it won’t be seen on the big screen for at least 25 years. When he was on form, the hyperactive motormouth we love from Good Morning Vietnam, Hook, Dead Poets Society and Mrs Doubtfire, Robin was making 30 jokes a minute. Now, because he insisted on a final say on such material, [the jokes] will remain in the vaults. The Times adds that this legal wrinkle means the company had to scrap a plan to make a fourth Aladdin movie. And can I just say: Good. There is nothing about that plan that wouldn’t be a cynical play on both nostalgia and the affection for a recently-deceased star. Not to mention that Williams wasn’t exactly a fan of the way Disney used his voice and image to market the first Aladdin movie, so why not just let this particular cash grab go? Sigh. Oh, right. The law closes a door, greed opens a window, I guess.